With fans around the globe using digital technologies to consume music at an unprecedented rate, thousands of emerging artists are now reliant upon music streaming as their main source of exposure. New pathways are opening for musicians to reach their fans every day, but the royalties from streaming services alone are not typically sufficient to support their career. Despite the advances in music-sharing technology, touring and live shows remain staples for emerging artists. So how do artists and promoters align the reach of streaming services and online ticketing with fans’ physical locations to better plan, promote, and manage live shows? To answer this question, Vertical Trail partnered with Gigable to create a music platform and app that uses curated playlists, geo-based concert discovery, and online ticketing to close the gap between artists and their fans—all while building a formidable big data asset. 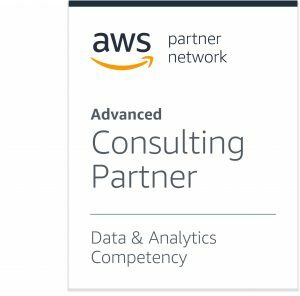 Vertical Trail is an AWS Partner Network (APN) Advanced Consulting Partner with AWS Data & Analtyics Competency and Amazon EMR Service Delivery designation. 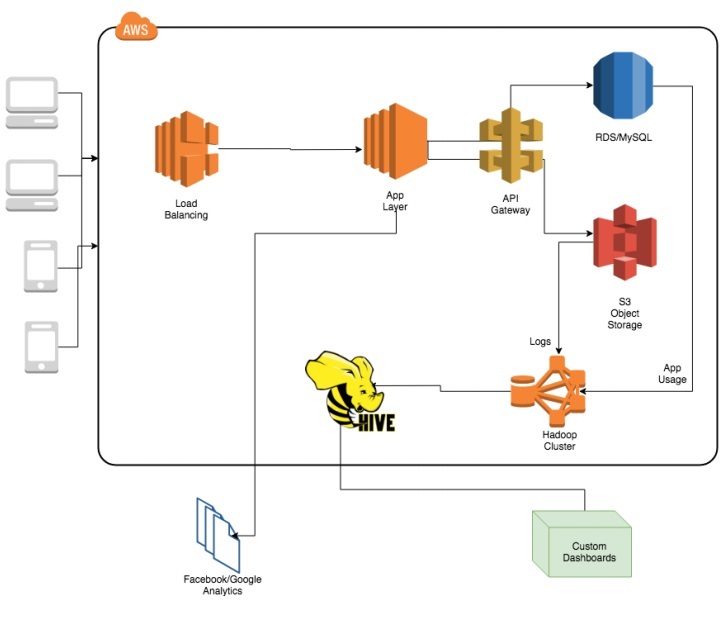 Amazon EMR provides a managed Hadoop framework that makes it easy, fast, and cost-effective to process vast amounts of data across dynamically scalable Amazon Elastic Compute Cloud (Amazon EC2) instances. 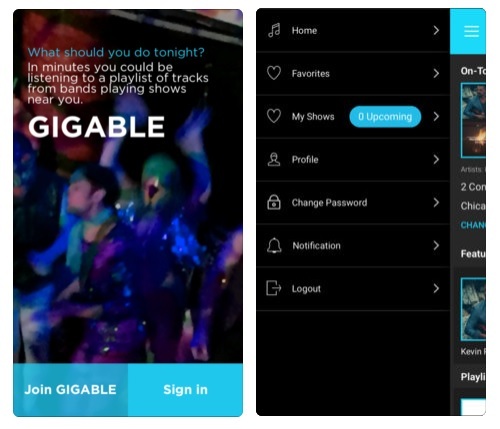 Gigable Music Discovery helps music fans find their next favorite band and see them in concert. Their curators scour thousands of playlists and outlets to find cream-of-the-crop emerging music, and listeners can easily uncover new artists and purchase concert tickets. Via direct relationships, these artists partner with Gigable to start building “target” regions. Listeners using the app can save their favorite songs and set reminders for upcoming shows. This information is shared with artists and promoters, who leverage those analytics to learn where their fan bases are concentrated. Over time, this geodata, along with “superfan” data (i.e. those with the highest listener hours), presents intelligent fan clustering data that shows the full picture of where fans are located, as well as their purchasing intent with respect to shows. Figure 1 – The Gigable music app allows listeners to easily stream curated playlists and find nearby shows. generated data includes full and partial song plays, session duration, navigation, and other factors contributing to the big picture of mobile analytics. The application of back-end API calls and other analytics tools and resources resulted in a multidimensional dashboard providing a highly accurate picture of the listener lifecycle. artists’ management companies of hyper-local information relevant to successful tour planning. How many listeners have saved show XYZ? How many unique listeners have favored song ABC? What are the top 10 songs in Illinois? What is the most favored song in Illinois over the past month? The deployment of this simple Smartbots interface allows more efficient, rapid delivery of insights to artists’ managers—without the need to develop elaborate visualizations. Amazon Simple Storage Service (Amazon S3) and Amazon EC2, which allowed for lower cost of deployment and high elasticity of the solution. Apache Hadoop, which played a primary role in establishing a data lake capable of growing with the company. Hive, which enabled different types of source data to be collected and stored in a uniform manner for efficient analysis. Smartbots.ai, built on the AWS Lex platform, enabled ad-hoc access to critical data points via simple chat commands, and sped up access to insights that would otherwise take full development cycles to produce. Figure 2 – The back-end architecture developed by Vertical Trail and Gigable highlights the application of big data components and capacity for growth. The bot is being trained to understand the context of touring and live shows. Over time, the bot will be able to provide predictive analytics that flag an emerging artist based on listener velocity and help talent buyers prioritize their show planning. The end result of our efforts with Gigable was the creation of an application with immense benefits for both fans and artists. On the listeners’ side, exposure to high-quality emerging music enhances their discovery experience, and their usage data assists in creating real-world opportunities to see their favorite artists live. Synergistically, artists and promoters can accelerate their career development and growth with access to targeted insights that would be otherwise lost in the shuffle of streaming data. Learn more about Vertical Trail and how our data-drive solutions can help transform your business. Vertical Trail is an APN Competency Partner. They provide data architecture and cloud consulting services, employing unique and proven framework to ensure every project is aligned with customers’ business objectives and delivered with an eye to maximum satisfaction.